Each year we take our 24' Bayliner out of the chuck (ocean) and bring her up the lake for a winter in fresh water. There are several advantages in doing this. The fresh water is good for the hull and every other exposed and internal part, the growth of algae and sea critters is brought to a screeching halt, and we have a bigger boat for lake cruises and for an added measure of safety during rough winter water. This weekend we took the Bayliner for a summer cruise to the head of Powell Lake. Powell Lake is a glacial carved fjord that is 51 kilometres (32 miles) long with 480 kilometres (300 miles) of shoreline. From our cabin at Hole in the Wall it about 36 kilometres (22 miles) to the head. Our first stop was the logging dock. We hiked through the log sort and found it full of fresh cut trees ready to be dumped into the lake for transport. We were surprised to see so much action because of the summer and economic slowdown. Next we passed through the camp built by Plutonic Power to support the construction of hydro lines from their run-of-river project in the Toba Valley. We continued up the logging road to the bridge that spans the Daniels River. During dry summer months, this is the main source of water for the lake. As you can see from the exposed stumps, the input isn't keeping up with evaporation and the outflow at the dam. We then took the Bayliner to the east side of the large bay and anchored where we would catch the last rays of the setting sun. There aren't many places on this steep sided lake where you can anchor, but we found one near Jim Brown Creek. We lowered Mr. Bathtub (our dinghy) and paddled to shore for a hike up another logging road. On the way we found tracks from elk reintroduced here last year. It's good to see they are flourishing in the lush environment. Looks like fall is coming early this year. Typically, it's October before Mr. Woodrat appears. That brings to mind a funny story I call "The Night of the Woodrat." The second year we had our float cabin, I was able to go up the lake by myself the week before Thanksgiving. Even though I grew up in Los Angeles, I had lots of experience outdoors and camping. I was confident my solo trip would be a piece of cake. Sleeping upstairs in the cabin's loft is usually peaceful and quiet. I built a fire in the wood stove to keep warm and turned in early to read. Before long, I drifted off, only to be roused by a racket downstairs. I keep a flashlight next to the bed, so I grabbed it and looked over the railing. At first there was no sound and nothing in sight. Then the quick scurrying of little feet caught my attention and a small furry critter scampered out of the darkness to appear at the foot of the stairs. There, as bold as could be, staring up at me was a woodrat (packrat). His large dark eyes and perky round ears were inquisitive, and his bushy tail twitched up and down with excitement. Now I must admit, as comfortable as I am with nature, sleeping in confined quarters with a small rodent isn't high on my bucket list. My first thought was, how in the world did he get indoors. My second thought was, how in the world was I going to get him back outdoors. I cautiously climbed downstairs and opened the sliding glass door. Of course, he didn't cooperate and exit on cue. I tried chasing him, but he avoided going anywhere near the door. Then I thought I was so smart. I piled firewood into a barricade to encourage him out on his next circuit of the living room wall. I tiptoed behind and chased him back towards the open door. But he ran right on past and over the wall like an Olympic high jumper. By now I was pretty tired and exasperated. On his next pass from the kitchen back to living room, he stopped at the wood stove, dove underneath and up inside. That did it. I left the sliding door open and went back to bed. I figured if he wanted to be indoors that bad, I could share my abode for one night. The next morning there was no sign of Mr. Woodrat. I'm sure he wasn't a dream (nightmare?) because the sliding glass door was open, it was a chilly 10 degrees inside, and there was firewood stacked in a tall pile leading to the doorway. Tonight was the second Star Party hosted by Powell River Books at the Town Centre Hotel in Powell River, BC. 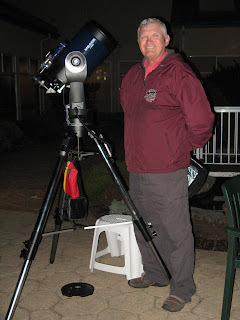 Wayne (with a little help from me) set up two telescopes in the hotel's courtyard. The goal was to introduce people to astronomy and the availability of affordable telescopes. 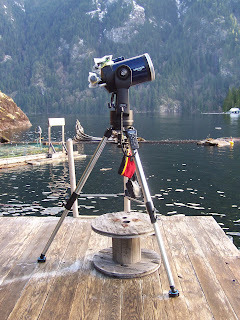 The Star Party was part of our contribution to the International Year of Astronomy. Around the world, amateur and professional astronomers have been hosting similar events. The moon slipped below the horizon before darkness set in, so we set up Wayne's more powerful Meade LX90 to focus on Jupiter. 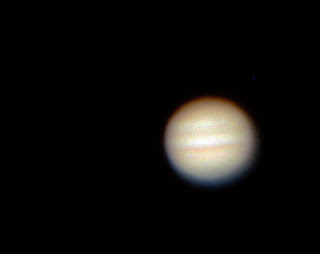 Jupiter is currently as close as it gets to the earth, and viewing is excellent. The four largest moons were lined up in a row, and the bands were quite evident. Thanks to the computer driven controllers on today's modern scopes, we were able to easily find and track the evenings best celestial objects. Participants of all ages had a good time, and they especially enjoyed their free commemorative hand painted constellation paper weights. Wayne and I want to thank Shelly, the manager of the Town Centre Hotel, for her ongoing support of events like these and Powell River Books. I am amazed at how dark and clear the sky can be here in Powell River. It's a perfect location for night sky exploration, even from the corner of our float cabin up Powell Lake. How would a distant intelligence contact earth? Shawna is an Air Force officer with remembrances of the future. Trapped in a structured military world, her unearthly memories persist for nearly three decades, culminating in a message from the stars. Meanwhile, on a distant planet, alien life is struggling to communicate with life on earth. Shawna is their target. 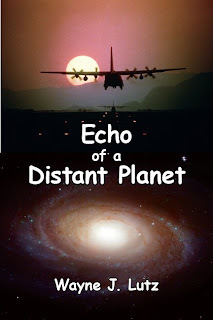 The author of six books in the series Coastal BC Stories ventures into an exciting new genre, military aviation science fiction, where the C-130 Hercules is the biggest hero. Click here for a look inside. Early in July, I wrote about the tragedy that struck our Barn Swallow nesting pair in And Then There Were None. All five chicks were either pushed or fell to their deaths from their nest under the peak of our cabin roof. On July 12, I wrote a Barn Swallow Update in which we built a "safety net" for future chicks. Shortly after, Wayne and I left for our vacation trip to Newfoundland. When we returned to the cabin last week, we were greeted by our nesting pair and the chirping voices of three new chicks. We were amazed at how big they were already. The other thing we noticed was how crumbly the nest appeared. This is its second season, and the second brood this year. The dry weather and heavy use was really affecting its stability. Yesterday morning when I went out to check on the chicks, the nest had broken loose on one side. One chick was still clinging to the left side, but the other two were nowhere to be seen. Wayne went up on the ladder, but there were no little bodies on the pad (thank goodness). The mother returned to the one chick several times. She would land on his back and give a nudge with both of her feet, like she was encouraging him to fly. After watching for a while, I went inside to cook breakfast. When I returned, the last chick was gone. The broken nest may have accelerated the three chicks' flying lessons, but it wasn't the disaster it could have been. This summer has been unusually sunny, hot and dry here in British Columbia. There is obviously an up side to this. The weather is good for camping, outdoor activities, tourism and, of course, heading up the lake. The down side is disastrous fires in the interior. Here on the west coast we've been both careful and lucky. Summer brings some pretty interesting clouds. 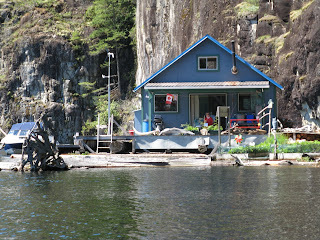 Here are a two captures from our cabin in Hole in the Wall on Powell Lake. The first is some high altitude cirrocumulus clouds. They looked just like puffs of cotton floating in a bright blue sea. 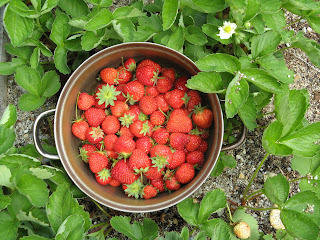 When I got back to the cabin, my strawberry plants were loaded and there were lots of over ripe berries. I hated to throw them away, so I decided to experiment with some easy refrigerator jam. I picked, cleaned and mashed all of the over ripe berries. I then added some less ripe berries to bring the mashed mixture up to one cup. Actually, my recipe book recommended this as a way to elevate the natural pectin content. Then I added one tablespoon of lemon juice and one cup of sugar. I gently heated the mixture in a heavy pot until the sugar was dissolved. Then I cooked it at a rolling boil until the candy thermometer reached 220º F (104º C). It cooked down a bit, but was still quite liquid. When it was cooled, it was still slightly runny, but oh so tasty! I put the jam in a sterilized jar, but did not complete the canning process. This jam is for immediate consumption and will be kept under refrigeration until gone. Today, Wayne and I came to town for a quad ride. The weather was warm, just perfect for riding. Thanks to a new quad trails book written by Dave, the president of the Powell River ATV Club, we feel more comfortable striking out on our own. 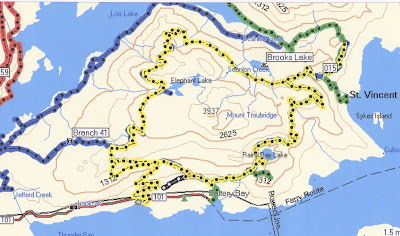 For today's ride we chose the Elephant Lakes Loop. Heading south on Highway 101 we exited on Stillwater Main (the first dirt road on the left after the bridge over the Lois River/Eagle Creek). At .9 km we turned right on Lois Main Forest Service Road (FSR) Branch 1 and found a wide turnout to park our truck and trailer. This is a popular road to the Powell River Forest Canoe Route launch site and campground. We popped in to take a look and there were lots of people enjoying the lake and camping. Back on Branch 1 we continued to the junction with Lois Main FSR Branch 3 (at 3.9 km). Just after the junction you will see a road sign to confirm that you are on course. Ride on Branch 3 for another 5.1 km to an intersection. Continue straight ahead and you are on the Elephant Lakes Loop. The trail follows old logging roads. There are lots of trees and it's cool underneath the green canopy. We did pretty well using the guide, but also had our Garmin Oregon 300 GPS with the topo maps installed. Several times we stopped to make sure we were on the right road. We made one wrong turn, but we got back on course after a quick lunch break next to the Sunshine Coast (hiking) Trail. As you climb into alpine country, the road narrows and gets rocky. We turned off at the Sunshine Coast Trail marker pointing to Saltery Bay. The short spur ends at the hiking trail the follows the lake shore. We parked our bikes and hiked in for a ways. The foliage still had dew drops on the leaves late in the afternoon. And all along the path there were blueberry bushes with plump berries. I tasted a few, and they are almost ready to pick. Rather than continue on the loop, we back tracked to our truck. I flew 3,992 nautical in an airliner, traveled 364 miles on a ferry, and drove 4,096 kilometres only to come home to Powell River BC to the most beautiful sunsets of all. That may sound a bit funny, but that's just what we did this last week. We loaded our tent, air mattresses, sleeping bags and other camp gear in duffel bags and flew by West Jet from Vancouver to Montreal to start a 10-day Canadian Maritimes and Newfoundland camping trip. This is the second time we've done it, and both trips were very successful. It's more economical than staying in motels and hotels. But more than that, we prefer camping as a way to get to see and experience new places. Flying to a distant location maximizes the time you can spend in your desired location, rather than spending most of your vacation driving to get there. Make airline reservations well in advance to get the best deals. Our camp gear and clothes fit in four duffel bags (2@24" & 2@28") and two backpacks. Check with the airline for bag limits. We got 2 checked and 2 carry-on each. Even though they weren't heavy, a cart at the airport made bag dragging easier. Check with your airline for good deals on car rental. Choose a vehicle with room to spread out wet items to dry while driving. We got a small SUV by accident and found it indispensable. Rent a vehicle with unlimited miles if you are taking a long trip. If you have a GPS with road maps, take it. If not, rent with the vehicle. Ours helped us out immensely. Buy a travel guide and map for planning, then stop at tourist information centres once you arrive. Make campground reservations before you leave. Most now have online services and you can cancel up to a day in advance to get a refund just like a hotel. Small ground tarp for under the tent. Two sleeping bags that stuff into small bags. Two collapsible coolers and 2-gallon Ziploc bags to keep ice from leaking, one for pop and one for food. Clothing and personal items (1/2 duffel bag each). Inverters for recharging devices in the car. Bug juice handy in the backpack. Computers, cell phones, books to read, etc. Two inexpensive chairs that we gave away at our last camp. Food and drinks for snacks and emergency meals. Bottled water in large containers. Lots of gas and ferry fees. Eat out (taste the local fare) or fix simple meals rather than elaborate cooking. At least one motel stop for a shampoo is nice, but many campgrounds have showers. There are enough free hotspots to stay connected. We're already planning a return trip in the near future. But next time we'll fly directly to Newfoundland. The airfare is higher, but our costs for six days of travel to get there will be eliminated. Tomorrow, Wayne and I are leaving on our first vacation away from Powell River since we discovered it in 2000 and especially since we got our float cabin in 2001. In the beginning, we were still working in Los Angeles, so we wanted to spend every vacation day we had up the lake. Now that we have our Canadian permanent residency, we feel we can take two weeks to explore a bit more of our new country. One aid we will have on this trip is our new Garmin Oregon 300 GPS. We have Mac computers and sometimes companies like Garmin don't offer software compatible with our machines. But we were in luck, according to our friend George (Mr. GPS) at Marine Traders in Powell River. We purchased the Oregon to use when we ride our quads in the bush. But we also got the City Navigator North America road map software for our upcoming trip. Wayne and I've been visiting Mom in Bellingham, so the first leg of our Canadian adventure started at Bellingham International Airport. That's where we caught the Quick Shuttle which provides international bus service between greater Vancouver (including to the departure gate Vancouver International Airport) and Seattle, Washington. See my May 2009 post if you would like more information. We packed all of our camping gear (tent, sleeping bags, air mattress, collapsible ice chests) in two 28" duffel bags we found at WalMart for only $17.00. They are sturdy with lots of pockets for smaller items. Our two older 24" duffel bags carry our pillows (Pikachu Pikachu), clothes, guide books and such. West Jet allows two free checked bags per person with a maximum weight of 23 kgs (50 lbs) and dimensions of 157 cm (62 in). We don't have much space for souvenirs, but that's OK.
We've flown in and out of Vancouver many times, but have never been in the Domestic Terminal. Today's trip to Montreal was our first. We chose to fly on West Jet because of price, and so far all has gone well. The check-in lines weren't too long, the agents courteous and the planes spiffy looking (now that's an precise aeronautical term). We chose to fly to Montreal because it was the furthest direct flight for a relatively reasonable price. FREE HOTSPOT WATCH: Quick Shuttle Coach (slow) and YVR Domestic Terminal (excellent bandwidth). Our landing in Montreal was on time and we took a cab over to the hotel. Jet lag didn't catch us too bad, so we were up at 8:00 a.m. to return to the airport to pick up our rental car. Wayne had reserved one in advance at Budget through West Jet (I love that airline!). We were an hour early, so they gave us a free upgrade to let us get on our way. We ended up with a Dodge Journey (SUV). It turned out to be the perfect vehicle for us. There's lots of room for our camping gear and the back seats fold down. We could sleep inside if the weather gets really rainy. In honour of his heritage and colour, I've dubbed him Monsieur Argent. The first day's drive took us through green countryside over mostly divided double-lane highways. Because it was going to be our longest (distance and time) travel day, we drove straight through. Our path took us east, then across the St. Lawrence River at Quebec City to Riviere-du-Loup. From there we followed Highway 2 southeast to a small town on the St. John River called St. Leonard. Most of the towns are either St, Ste, St. or Saint in this region. Must because of their French ties. Even though every local we met spoke French, they were friendly and accommodating with our English. That's a lot different than I remember from our last trip to Quebec by airplane. We camped at a private facility called Grande Riviere just outside of town. We set up our tent next to a small river. I could imagine a French trapper paddling his canoe up such a stream to catch beaver. We had reservations, but wouldn't have needed them. We were the only tenters and there were hardly any RVs either. It was a nice park with lots of green grass, a few shaded sites, restrooms with showers, and a pool. Quite retro. I'm sure it looked just the same when my parents passed through years ago. After we set up our tent we went into town for dinner at the restaurant at the Daigle Motel. Good home cooking for a good price. We had a bit of rain overnight, but today dawned sunny and warm. The mosquitoes were out last night, but I think the rain kept them to a minimum. Don't think I have any bites to show for my outdoor experience yet. FREE HOTSPOT WATCH: Fred-e-Zone is Fredericton NB's free citywide wireless service. Excellent bandwidth, Wayne watching TV on Slingbox. Day two of our Maritime adventure was another long driving day. After we left Fredericton NB (an extended hot spot stop in the provincial capital of New Brunswick), we got back on Highway 2 heading southeast. That will be three provinces in two days of driving! Our new Garmin Oregon 300 GPS has been quite a help. We've also learned a bit more about how to use it. We set in a destination of Halifax via Highway 2. 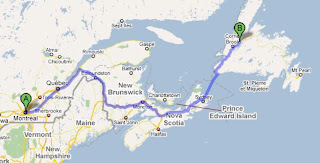 When we exited at Fredericton, the GPS gave us the routing needed to return to our original route. Nice! Back on the highway, I saw the first white-barked birch trees. Those few gave way to large groves in some sections. You always hear about birch bark canoes being used by First Nations peoples here on the east coast. You can see that they were in ready supply. The road to Halifax was doublewide all the way. The climate seems drier here and the terrain in rolling hills interspersed with flat coastal plains. One section had a toll of $4.00. It was short, so they must have been collecting to pay for more than that little bit. Just north of town we turned off onto on Nova Scotia Highway 2 and headed to our campground for the night, Laurie Provincial Park on Shubenacadie-Grand Lake. It’s a small rustic camp, but the sites are nice in the shade of evergreen trees. We were lucky to get one on a bluff overlooking the lake. By evening, almost all of the spots were taken. Here there are more tenters like us. After putting up our tent, we headed to Halifax for dinner. We entered town from the north through Dartmouth. There are two high bridges crossing the harbour, both of them toll bridges charging 75 cents. Must be the way Nova Scotia pays for transportation services. After a bit of fumbling at the tollbooth, we were on our way to the wharf area downtown. Cars were parked everywhere on the one-way streets, but we found a public lot just a few blocks up. I was surprised at how touristy it is. The boardwalk was very crowded, with lots of street musicians. We found a harbour view restaurant and had a much needed meal. We passed on the overpriced lobster for the Captain Catch plate and a cold brew. Double yum! Day 3 was from Halifax to Mira River NS. Not such a bad trip considering the last two days, but it still took us over four hours driving time. After our exhausting drive back to the campground (our GPS at first led us to the wrong destination), we turned in right away. It was a good thing we put up our tent before we left. As I was sliding into my sleeping bag, I heard a loon crying in the distance. We were surprised to hear one this far east, but the lake environment is perfect for them. We got a mournful serenade as we tried to drift off to sleep. And just when we were almost successful, we heard another mournful sound. Well, if it had been in the distance it would have been. But since the campground was right next to the railroad tracks it was a bit more loud than mournful. Our first stop (after breakfast at Tim Horton’s that is) was Don and Marilyn’s house. As I’ve mentioned before, it is a small world. Our good friends Helen and Ed from Powell River were originally from Halifax. Helen’s brother still lives here so we stopped by to say hi and get some pictures for Helen. It’s been quite a few years since they’ve seen each other. Don and Marilyn live on two gorgeous acres northwest of town. Don does all the mowing, but I’m sure Marilyn has a hand in all the beautiful flowers. It was a quick visit, and then we were on our way north to Sydney and another provincial park camping spot. The drive to Sydney was through green pastures then back to the mixed forest. There are more deciduous trees here than in Powell River. I guess that’s one reason they are so well know for their fall foliage. When we got to Cape Breton we had to cross the Canso Causeway across the narrow stretch of ocean that separates it from the rest of Nova Scotia. Just as we arrived the traffic stopped and the small bridge at the end rotates to allow two sailboats to pass. The canal they used wasn’t large enough for anything larger than a fishing boat. Large commercial boats must have to go all the way around the north end of the island. Our first stop was for dinner in Louisbourg. It is the site of the historic French Fortress. Wayne found us a restaurant that wasn’t too touristy (The Grubstake) and then we went down to the docks to see the skookum fishing boats. Then it was back to the Mira River Provincial Park to camp for the night. We got a much-needed “bath” swimming in the lake and then were off to bed early. People have been coming here for generations. Here's the famous song "Out on the Mira" telling all about it.